Pink: Water Bandit, Rain Bandit (ピンク みずドロボウあめドロボウ Pinku Mizu Dorobō Ame Dorobō). Heres are my remastered Versions of the Original NBC Promo Teaser Commercial Ads for the Captain N The Game Master Season 2 Episode "I Wish I was a Wombatman" and for the Adventures of Super Mario Bros 3 Episode "Super Koopa"
Heres the 2nd and FInal part of my Playthrough of the Easter themed Rom Hack of Super Mario World! EnjoY! and Have a Great Easter Sunday Everyone! This Sunday is Easter Sunday and you kn ow what that means right!? 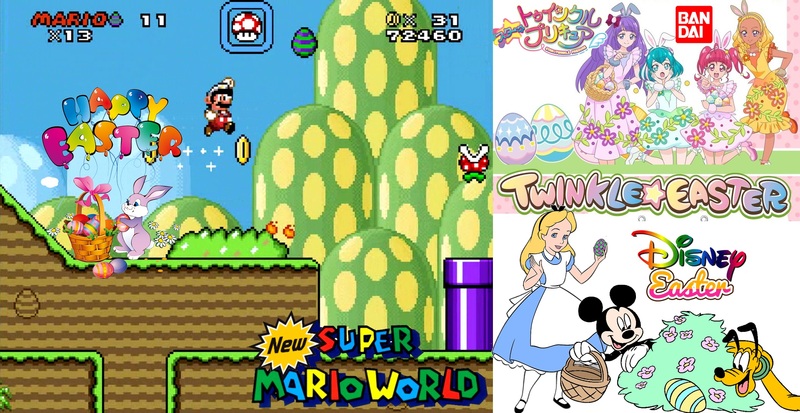 Well besides the easter bunny delivering you your fav chocolate candies, but also time to celebrate Easter Sunday with this neat short easter themed Rom Hack of Super Mario World that was recently released on Rom Hacking! Ok,the plot in this rom hack is a bit silly and weird but fun,basically Larry Koopa (Cheatsy Koopa) Stole Mario's fav Chocolate Easter egg Candy and needs to collect 15 easter eggs to get it back! A bit different from the usial "Save Princess Peach" Cliched plot.lol. 3 Easter eggs are hidden in each stage which Mario needs all 15 of them to allow him entrance into the koopaling's Castle! The Japanese Version of Dragon Quest II had some unique official Artwork of the 3 main characters, The Prince of Midenhall, The Prince of Cannock and the Princess of MoonBrooke,which the character designs were done by Iconic DragonBall Z and Chrono Trigger Character Designer "Akira Toriyama"
A New Custom Wallpaper I recently Made featuring official artwork of Emiru (Cure Macherie) from Hugtto Pretty Cure and Official Artwork of Madchen from Dragon Quest V: Hand of the Heavenly Bride! Pretty Cure Miracle Universe Original☆Soundtrack - Pretty Cure! Miracle Universe・Twinkle! This is defentially one of the best Dragon Warrior 1 (Dragon Quest 1) rom hacks ever made when I first discovered this back around 2003! Gone is Dragon Warrior 1's protagonist Erdrick the great Dragon Warrior,and now replaced with a lone female protgonist named Nika,who is a Bounty Hunter Meta Knight who is forced into a battle against her own will by lord vin to hunt down an evil alien called the Neverborn or else he'll have her executed! unlike Alis Landle from Phantasy Star 1 however,Nika doesn't need any allies as she can fight this entire war by herself.lol. Nintendo Power's old 90's Witty Walkthrough Strategy Guide to this iconic classic Beat'em up Sequel "Final Fight 2" from Capcom! The Mad Gear Gang are back to thrash Metro City once again,but not to worry because Nintendo Power gives gamers in depth Tips and Tricks on how Mayor Mike Haggar,Maki and Carlos can survive against the Mad Gear Gang' s newest toughest Members,including they're new Boss Retu! 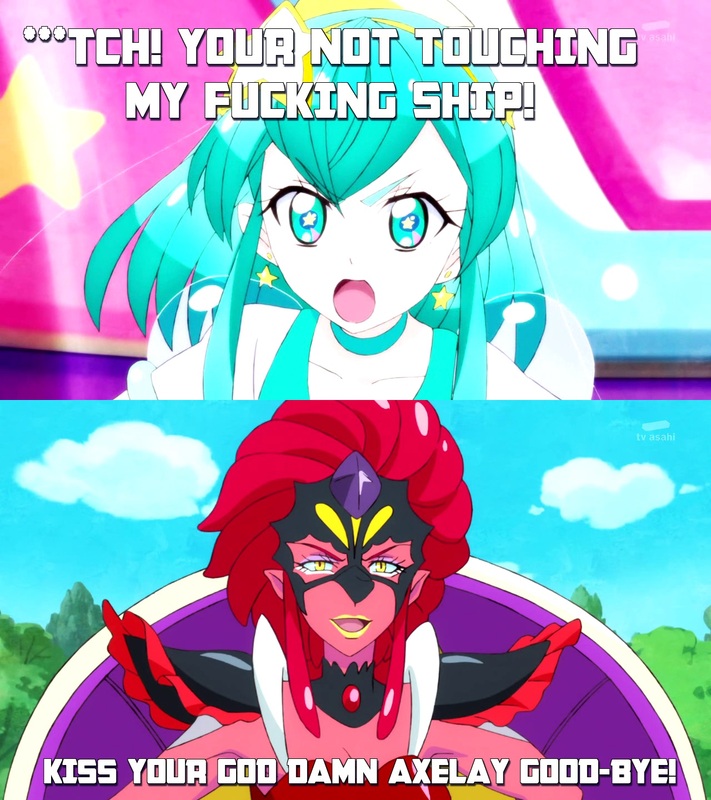 In the Latest New Episode of Star Twinkle Pretty Cure which came out today,The Star Twinkle Cures (Cure Star,Milky,Soleil and Selene) get they're First Group attack called "PRECURE SOUTHRN CROSS SHOT"
anyway,a Trend in Recent Precure seasons is that whenever the Next new group of Precures from each season get a new group attack,it ussially hurts the quality of the season for Future episodes,However,this is one of the better ones,it's simple,colorful and not too Over the top Sugar Fluffy and Sparks and Defentially way better than KiraKira's and Hugtto's Group attacks by a Longshot! During the 80's and 90's. The Side Scrolling Beat'em up Genre loves to have Sewer themed Stages in every single one of they're games they Make,wheather it be Final Fight,Batman Returns of Teenage Mutant Ninja Turtles 2: The Arcade Game! Nintendo Power's 8-bit Explosive Tips and Tricks Walkthrough Guide of Hudson Soft's Bomberman II for the NES! Nintendo Power gives some Helpful witty Tips and Tricks on how White Bomber can survive these Deadly Action/Puzzle Mazes! Bomberman 2 was featured in Issue (Volume) 45 of Nintendo power Magazines! anyway,heres Nintendo Power's entire Tips and tricks strategy Guide of Tiny Toon Adventures of the NES! A New Random "Hugtto Precure" Custom Wallpaper I Putted Together featuring Homaru (Cure Étoile) in her Ice Skating Princess Outfit at the Ice Skating Rink! My Playthrough of the First Stage of Dino City,an obscured early 90's Super Nintendo game which is a platformer similar to both the Adventure Island Games and Super Mario World which you can choose from two Human characters,a Male and a Female character who can ride on Dinosaur Buddies! in japan this game released for the super famicom as Dinowars: Kyouryuu Oukoku e no Daibouken,and when it was brought to the U.S.........well,just like every other japanese game at the time,we got screwed with another derpy misleading american box art,which the japanese box art is way better,so what else is new.lol. Heres Nintendo Power's Old 90's Walkthrough Strategy Guide of Hal Laboratory's Adventures of Lolo III,which was featured in Issue 24 of Nintendo Power Magazines! Anyway,having trouble Beating Adventures of Lolo 3? Well Nintendo Power's Witty handy Dandy Strategy Guide will give gamers helpful tips and tricks on how to overcome some of the game's most toughest challenging puzzles and Bosses! Our fav Spunky Red Head Willow Eating Witch "Cotton" from Sucess's "Cotton: Fantastic Night Dreams" series teams up with the Precures from KiraKira Pretty Cure a La Mode,Hugtto Pretty Cure and Star Twinkle Pretty Cure! the soundtrack to Axelay for the Super NES,which is another excellent Shoot'em up title from Konami which is one of Konami's best early 16-bit space shoot'em up games next to Gradius 3 and Pop'in Twinbee! the game uses both 2D Sidescrolling and split Mode 7 Overhead view shooting stages! here are some more random high quality Fan Made Fox Kids Bomberman Jetters Custom Wallpapers I made out of pure bordem using more Music from the Sonic X 4kids English Dub! With the Recent Release of the latest New Precure Crossover Movie "Pretty Cure Miracle Universe" which recently came out in japanese theaters,to Celebrate,I putted together a New Wallpaper where Ichika (Cure Whip) from KiraKira Precure a La Mode, Hana (Cure Yell) from Hugtto Precure,and Hikaru (Cure Star) from Star Twinkle Precure decide to throw a 2 year Anniversary Birthday Party.lol.